The Assignment: Base a piece of music on your previous 12 hours. Deadline: This project’s deadline is Monday, November 5, 2018, at 11:59pm (that is, just before midnight) wherever you are on. It was posted in the early afternoon, California time, on Thursday, November 1, 2018. Step 1: Think about your previous 12 hours as of the moment you begin this project. Step 2: Note one single thing that best summarizes each of those 12 hours. That is: one thing for each of those 12 hours. Each “thing” should be one strong association with that hour, such as what you did, what you felt, what you thought, where you were, and so forth. This step’s process will result in a list of 12 things in sequence. Step 3: Record a short piece of music consisting of 12 segments that reflect each of the 12 items that surfaced as a result of Step 2. You might make transitions between the segments, or have them immediately follow one to the next. 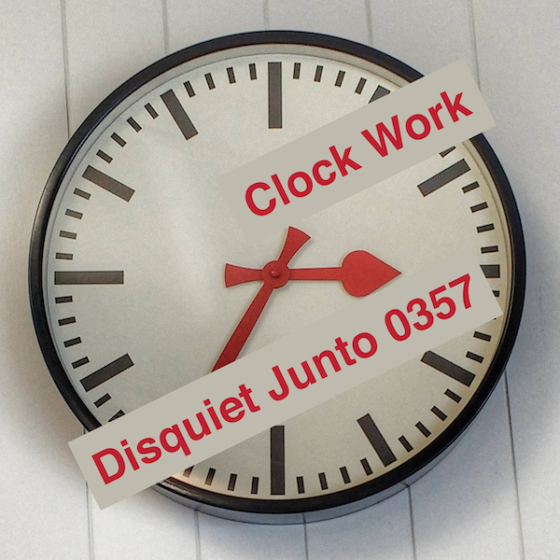 Step 1: Include “disquiet0357” (no spaces or quotation marks) in the name of your track. Step 2: If your audio-hosting platform allows for tags, be sure to also include the project tag “disquiet0357” (no spaces or quotation marks). If you’re posting on SoundCloud in particular, this is essential to subsequent location of tracks for the creation a project playlist. Title/Tag: When posting your track, please include “disquiet0357” in the title of the track, and where applicable (on SoundCloud, for example) as a tag.